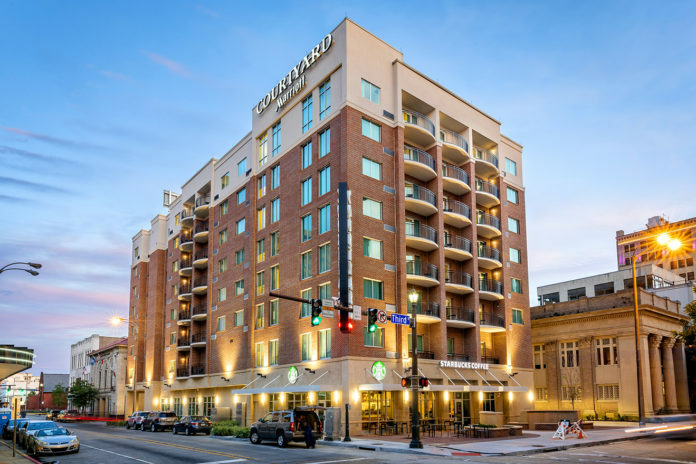 When the new Courtyard Marriott on Florida and Third streets officially opens later today, downtown will have more than 1,000 hotel rooms to offer visitors—a long-sought milestone that tourism officials say will make the Raising Cane’s River Center more attractive to convention groups. The hotel is downtown’s seventh and adds 135 rooms to the central business district submarket, bringing the total number of rooms to 1,176. It has been more than four years since south Carolina-based Windsor Aughtry began planning for the hotel. Though in the works before local developer Mike Wampold’s nearby Watermark Hotel—which also flies a Marriott flag and is also located on Third Street—progress was slowed, in part, because the Metro Council initially stymied Windsor Aughtry’s efforts to obtain Tax Increment Financing. Then, once the deal was underway, construction was hampered by persistent weather delays and the challenges of building eight stories up on a narrow downtown street. Still, the market has remained relatively strong and Rhorer says demand for more hotel rooms downtown exists. Between January and June last year, average hotel occupancy downtown was at 65% while the revenue per available room was $81.75. That’s down slightly from 2017, when occupancy topped 70% and RevPAR was $88. City and DDD officials will celebrate the opening of the hotel with a ribbon cutting at 4 p.m.